In the above picture we can see a schematic of the traces a scribe must make in order to write the above letters. If one notices carefully, the top YOD in the Tiberian Style is done with one swoop. The scribe comes down in a 33 degree angle and then folds back over his initial stroke. The same movement is done when writing the foot of the ALEF or the nose of the PEH. 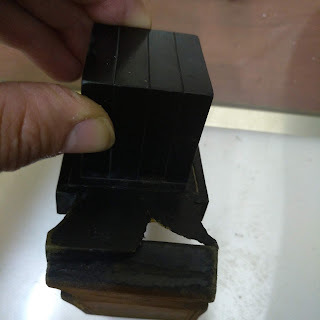 A feather, due to it's greater flexibility is not well suited for this type of backwards movement which comes natural when writing with a reed. It is this type of movement that causes the impression of the head protruding from both sides of the foot. Our Rabbis described this shape as "Ke'ein YUD" i.e... similar to a letter YOD, but not quite. Today, we have become hyper-literal in interpreting many of the written descriptions of what constitutes Ketav Ashurit left by our sages of old. But the truth is that a single picture can be more telling than a thousand words. 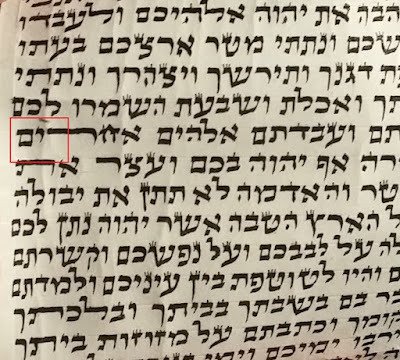 We are fortunate to live in a day and age when we can all see how Torah was written two thousand years ago, and how our script has changed through the ages. Many of these changes are due to differences in writing implements, geography, surrounding culture, and decisions made by our Rabbis. For example, the Ketav Ashurit utilized in Ashkenaz during the 1200's is much different from that which we employ today as our Bet Yosef Ashkenaz standard. You must know that in Christian Europe the quill-pen was the main scribal implement. Likewise, the Gothic style of writing prevailed during the 13th Century general culture and found great expression in calligraphy as well as the arts and architecture in general. 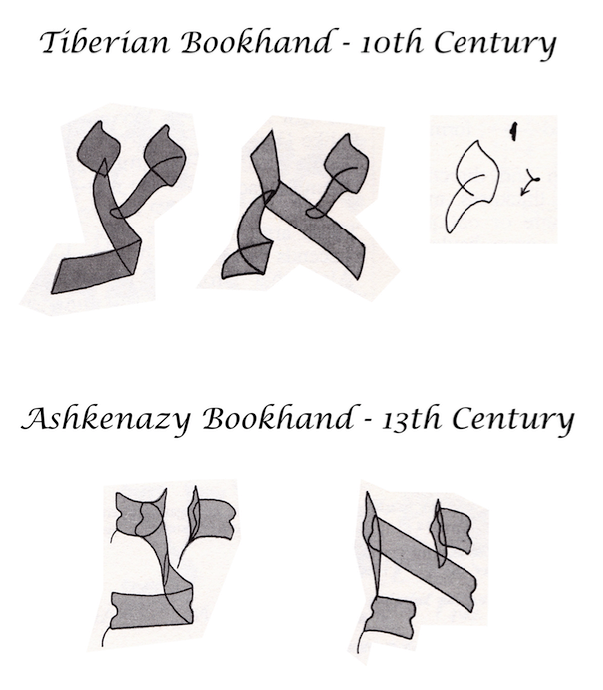 The Ashkenaz Hebrew scribe was heavily influenced by this new style. The pen was no longer held at a 33 degree angle. Rather, it was held straight. The horizontal strokes became very thick while the downward strokes became either very thin or broke into two separate "romboid" shaped downward strokes as seen on the descending part of the Tzade above. There was no YOD in the Ashkenaz TZADE. Rather, just like the ALEPH, it was flag shaped and facing to the right; similar to what we find in the Arizal TZADE. All of the Sha'atnez Gez letters had an additional short concave stroke on the top left. This is a Gothic style influenced decorative stroke called a SERIF that in essence lengthens the ROSH and gives it a more distinguished presence. Likewise, a tiny thin string (which we sometimes call TAG and/or KUTZ) curves downwards from the lower corner of the decorative Serif stroke. This same decorative prickle or thorn is also added to the left bottom of the base. 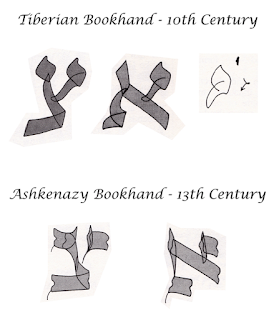 Please see the above 13th Century Ashkenaz TZADE to see what I mean. Heaps of significance are attributed to these. But this is just part of our folklore, and part of what makes us a special and unique people. The bottom line is that, our ancestors utilized and were YOTZE with their STaM with scripts that varied from the norm of what we are accustomed to utilize today. If Zvi wants to elongate the right head of all TZADES in his personal mezuzot, I believe that that is his his personal RESHUT and he will be YOTZE with them. However, to do so for the wider OLAM would not be proper, as people expect certain standards that our Hakhamim have established for our own day and age. Thanks for this very informative technical explanation. But the issue is not really whether the "corrected" mezuzot would be kosher. 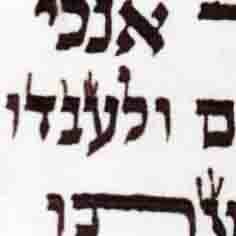 The issue is why elongate the head of the צ when as you, say, there were always variations within the Ktav. To insist on writing the right head of the צ this way while ignoring the facts of the history of Ktav is nonsensical. Yes, I agree. However, if he wants to do it for his OWN mezuzot because of a particular stylistic preference, as long as he is within the bounds of what halakha accepts as a kosher letter, that is his very own personal privilege. There is no particular necessity to restrain him. In matters of personal taste, things do not have to make sense. It is reminiscent of the well-known Nakdan on the ספר התרומה סי' ר"א who explains that the three shittos brought there for tagei Shaatnez Getz are based on how the kulmus was held at different periods in time.